Introduction: The movement against oppression and poverty and for worker rights in the US has always suffered from the fact that workers – all workers – in the US lack their own party through which the popular movements can organize and fight. As a result, these movements have tended to be a bit scattered and have tended to get derailed by the corporate-controlled Democratic Party. The next logical step of the new movement that is building in the streets will be the running of our own candidates as a step towards building a new, radical mass workers’ party. Because of that, we can learn a lot from developments in other mass workers’ parties. Here, Roger Silverman reports from London on the British Labour Party and the “Jeremy Corbyn Phenomenon”. 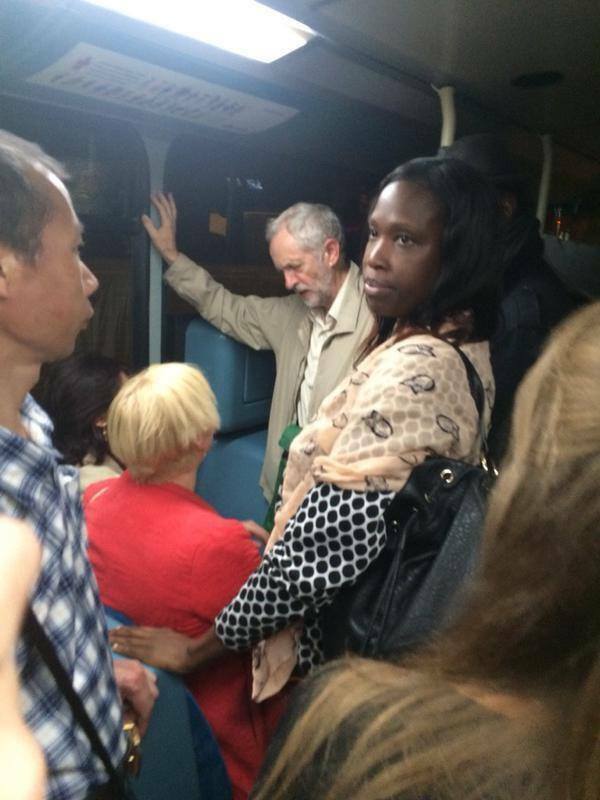 Jeremy Corbyn headed home on the bus (!) after a day’s campaigning. No big entourage or limo for him. The latest manifestation of the popular revolt sweeping Europe against austerity is the campaign in Britain in support of Jeremy Corbyn – one of the few remaining left Labour MPs – as leader of the Labour Party. It has already transformed the outlook and shone at last a ray of hope into the gloom induced by the Tory victory in May’s general election, with its brutal programme of welfare cuts and attacks on trade-union rights. The likely impending victory of Corbyn has generated a rabid scare campaign by the media. One newspaper shrieked that “140,000 hard lefts” were plotting to infiltrate the party. (It was news to most of us that we had anything like so many co-thinkers.) Another warned that if Corbyn won, the Labour Party would become “another SYRIZA – completely unelectable”! (They appear not to have noticed that SYRIZA won its last election, while Labour lost.) Only three months ago, the only party putting a clear anti-austerity policy at the general election – the Scottish National Party – swept the board, winning 56 out of the 59 Scottish seats, while the Labour Party – in its former rock-solid red-belt heartland – was literally wiped out. It seemed that the groundswell of anger against the government might bypass a slowly decomposing Labour apparatus. But as often happens, events are developing in a paradoxical, contradictory and ambiguous way. It is overwhelmingly the trade unions who make up the solid base of the Labour Party, and it is trade union members responding to the appeal of UNITE who make up the bulk of those who have registered to support Jeremy Corbyn. Under Corbyn, the Labour Party would become revived. Along with more radical policies – renationalisation of the railways and utility companies, reversal of welfare cuts, etc. – there would be some restoration of the party’s former democratic structure. There could be a healthy influx of workers and youth into the currently hollow shell of the constituency parties; probably, too – for better or worse – a reorientation towards Labour by some at least of the left groups. If Corbyn wins, then it may be that some right-wing Labour Members of Parliament (MPs) will split away; this option is already being seriously debated. Alternatively, they are considering triggering a coup by refusing to recognise the outcome of the vote, undermining the new leader, plotting a new leadership election within a year or two, or just plain splitting. One said: “We cannot just allow our party, a credible party of government, to be hijacked in this summer of madness.” A right-wing breakaway from Labour under the barrage of a hysterical press campaign to discredit Corbyn would enjoy flattery, bribery and glittering rewards from the ruling class and the media. The Labour Party could initially be reduced to a much reduced faction in parliament, pilloried by media abuse. If the Corbyn campaign fails, or if the right wing succeed in using legalistic or constitutional tricks to reverse his election, or if he succumbs to the overwhelming pressures to which he will be subjected… then the trade unions could still find other means to make their voice heard, including – as they have warned several times – by launching an alternative party. The workers have no choice but to fight back; they need a political voice. The class tensions within the Labour Party can’t be reconciled; sooner or later it has to come to a split. If Labour MPs refuse to represent them, then the trade unions will have to find another route. The railway union RMT had already broken away from the Labour Party as long ago as 2004. Even the Communications Workers’ Union seriously debated the issue in 2009; in a consultative ballot by London members, no less than 96% of the membership voted in favour of immediate disaffiliation. The leader of Britain’s biggest trade union UNITE, Len McCluskey, has many times threatened in so many words to disaffiliate Unite from Labour and launch a new workers’ party, demanding that Labour prove itself “the voice of ordinary working people “. And only two weeks ago, he repeated his warning yet again: that UNITE would “disaffiliate from the Labour Party if it does not elect the correct leader… and prove it is the voice of organised labour“. Two classes cannot share one party. The mass of trade-union rank-and-file Labour activists and the parasitic clique of New Labour crypto-Tory MPs who have made their nests in the parliamentary party cannot preserve for much longer their current uneasy cohabitation. These are not just a new generation of the old-style reformist Labour leaders of yesteryear – tainted individuals perhaps, cowardly, treacherous, bribed or intimidated, but with roots firmly implanted in the labour movement. They are a “virus”, as Dave Ward rightly said. Like any organism, to regain its health the Labour Party needs to rid itself of this virus. Corbyn’s candidacy has acted as a catalyst in polarising the opposing forces within the Labour Party. Sooner or later, a clean parting of the ways is needed. This would liberate the labour movement. Despite superficial similarities, the Labour Party is not at all the same as the US Democratic Party. That party started as the slave-owners’ party and was taken over by the capitalists after they defeated the slave owners in the Civil War. It can never be made into a workers’ party. The Labour Party was founded at the beginning of the twentieth century as the political arm of the trade unions, which had grown exponentially and needed parliamentary representation to resist the legal restrictions placed in their path. Long before it was yet even formally a socialist party, Lenin had advocated its admission into the Socialist International, on the grounds that it was the political voice of the trade unions and that, whether or not it recognised the class struggle, “inevitably the class struggle would recognise it”. Sure enough, in 1918, under the impact of the Russian revolution, the Labour Party adopted a constitution committing it to socialist aspirations: a society in which “the workers by hand and by brain” would receive “the full fruits of their labour”. In 1921, Lenin advised Britain’s fledgling Communist Party to affiliate to the Labour Party. The Labour Party used to have a socialist constitution, a decisive trade union block vote, an elected national executive committee, a genuine policy-making conference, an active working-class base, and a parliamentary party largely composed of former workers and trade-union officials. It was created by the trade unions, stood for a socialist transformation of society, and actually at one time carried through nationalisation of some basic industries, the foundation of the national health service, and comprehensive education. The Tories bitterly opposed every one of these measures, and did all they could to reverse them at the earliest opportunity. It took years of struggle by the working class to achieve them, and their implementation by Labour Governments was rightly celebrated as a historic victory. For all its corruption and bureaucratisation, Labour was manifestly a party based on the working class, and its leaders had to hypocritically justify every treacherous twist and turn with reference to the interests of labour and the cause of social reform. Under sustained pressure, the leadership of the Labour Party has usually betrayed the workers’ hopes. Labour’s first Prime Minister Ramsay MacDonald in 1931 broke his electoral mandate, split the party and formed a coalition “National Government” – in effect, presided over a Tory government – in order to carry through a programme of savage cuts. However, the 1945 Attlee government – swept to power on a tide of revolt against the system which had offered only the hunger of the 1930s slump and the slaughter of the world war – did carry through a wave of radical reforms, including the nationalisation of many basic industries and services ravaged by the war and the creation of the much-loved National Health Service. Soon, under capitalist pressure, it reverted to a programme of counter-reforms – a trend largely continued by the Wilson and Callaghan governments in the 1960s and 1970s. Nevertheless, even the right-winger Gaitskell fought the 1959 election on a manifesto of wholesale nationalisation; and right up to the 1980s, the party conference was committed to “a fundamental shift in the balance of power and wealth” in society. From the 1960s to the 1980s, the group around the paper Militant built a formidable base as a Marxist tendency within Labour. They introduced thousands of working-class youth to socialist ideas, led mass campaigns and played a major role in forcing Thatcher’s resignation in 1990. To the jeers of sectarians, Militant in its day argued that Labour was, for all the betrayals of the leadership, still the workers’ traditional party, to which they would turn first in their search for a political solution. In the 1980s, however, amid baying media hysteria Militant fell victim to an inquisitional witch-hunt and mass expulsions. During the 1990s, after a decade of privatisations and attacks on workers’ rights under Margaret Thatcher, an openly pro-capitalist clique assumed the leadership of the Labour Party, led by Tony Blair, Peter Mandelson and Gordon Brown. Mandelson openly boasted: “I am supremely relaxed about people getting filthy rich, so long as they pay their taxes.” They attacked Labour’s socialist and trade-union traditions and proclaimed a new identity, calling themselves “New Labour”. Where in the late 1950s Gaitskell had tried unsuccessfully – in the teeth of resistance from the rank and file – to renounce that clause of the party constitution (Clause Four) which set out Labour’s socialist aims, they succeeded. The party’s constitution and programme changed drastically under the New Labour regime: Clause 4 was dropped, and the role of the trade unions in the party structure was reduced mainly to fund-raising. There was a reversal in Labour’s relationship with big business. Previously, Labour had still campaigned for the nationalisation of the “commanding heights” of the economy, and in the 1960s and the 1970s, Labour governments still carried through some reforms. In contrast, the New Labour governments carried much further than even Thatcher dared to go her reactionary crusade: partial privatisation of the NHS and state education, the introduction of tuition fees for students, an astronomical rise in the prison population, etc. In the past, Labour governments had been tolerated only when capitalism was suffering a crisis, and only then with gritted teeth, for brief periods, and under relentless pressure. The first Wilson government complained that it had been blackmailed by the “gnomes of Zurich”. Back in power in 1974, when Britain was gripped by power cuts in the wake of the miners’ strike, and the Tories had lost an election called on the issue of “who runs Britain: the government or the trade unions?” – the second Wilson government was rocked by runaway inflation, waves of strikes, terrorist bombings, and open speculation of an imminent Chilean-style coup. The capitalists showed a very different attitude towards New Labour. For an unprecedented three successive terms of office, they patronised it as their preferred instrument of government, temporarily abandoning their traditional party the Tories and showering donations on it. During the thirteen years of government by a “New Labour” clique which abandoned the party’s socialist aspirations, undermined the link with the trade unions, destroyed party democracy, bad-mouthed its Labour heritage, and carried through ultra-Thatcherite policies that even the Iron Lady herself had shrunk from, its leaders openly proclaimed themselves champions of big business. They even adopted a new name, to differentiate themselves from Labour’s historic traditions. New Labour served a very specific historical purpose for the ruling class: to carry through to a conclusion the Thatcherite counter-revolution under new wrapping, once the Tories had become so discredited that they were no longer capable of finishing the job under their own banner. It was the product of a conscious conspiracy by the ruling class. Only in the wake of the financial crisis of 2008 was New Labour deemed to have outlived its usefulness; once having served its purpose in government, it was unceremoniously ditched. Now the reins of power have been firmly grasped by Britain’s traditional masters – the products of Eton School, Oxbridge, the Church, the army and the top people’s exclusive clubs. The Blairite MPs have no allegiance to the labour movement, nor any aspirations to a new society. They are plain careerists who at a certain time found it opportune to jump on the New Labour bandwagon – an alien force hostile to the workers’ interests. This could not continue. Either there would be an influx of workers to regenerate the party, or a breakaway by the trade unions and the creation of an alternative party, or a combination of both: attempts by some trade unions to reclaim the Labour Party, alongside movements by sections of worker activists to replace it. Just as after the defeat of the last Labour government in 1979, when there was a sharp swing to the left among Labour supporters and a historic vote for the left-winger Tony Benn as deputy leader, so now – in a delayed reaction reflecting the workers’ shock at the savage scale of Tory attacks – a new wave of revolt is at last on the horizon. The new influx of workers and the surge of support for Jeremy Corbyn is only the beginning of a new era of struggle. Millions of workers are gearing up for a fightback. Young people especially are being victimised by the new Tory government, through mass unemployment, dead-end low-paid jobs, soaring tuition fees, a housing crisis. The new government seems hell-bent on provoking a new outbreak of riots and looting as in 2011, to justify intensified police repression. One of the most encouraging features of the Corbyn phenomenon is that young people are now flocking to his support. Already, win or lose, the Corbyn campaign has transformed the mood throughout Britain.